Seems to me that once you stop blogging for a while it can get hard to start again! Sorry for the long gap. I reckon I got out of the habit while I was away on my bike, travelling very light, for most of last month. T and I cycled from London to Co. Durham, then back across to Whitby and finally down to Scarborough, where we loaded the bikes on the trains and came back to London. We saw so many things I'm still digesting it all! Finally I learned what everyone else in the country knew, that the Tour de France cyclists would be cycling southwards down from Yorkshire, and to my surprise I realised we were following much of the route (in reverse and very much slower) northwards through England. Would we meet them on the way? I hoped not. 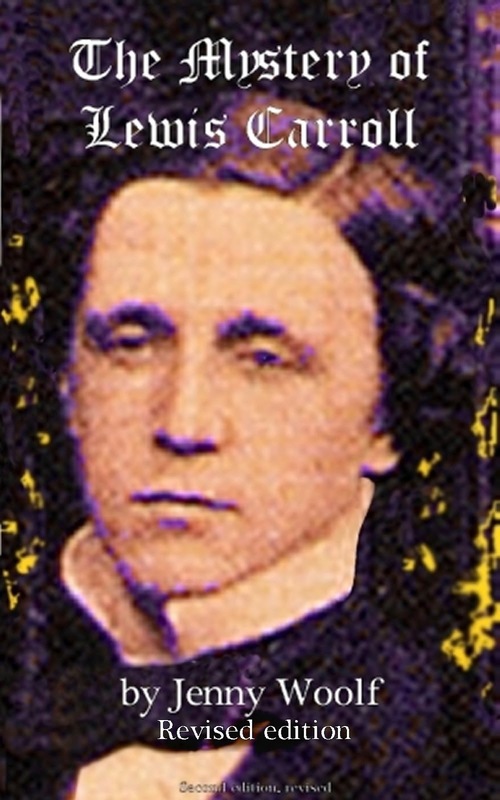 When we reached Cambridge, which was expecting them in a couple of days, it was bristling with "No Bike Parking" signs and it was clear that if we got in the way of these top sportsmen, we would be mown down, swamped in the crush of bodies, etc. When we did arrive in York, they'd just left. 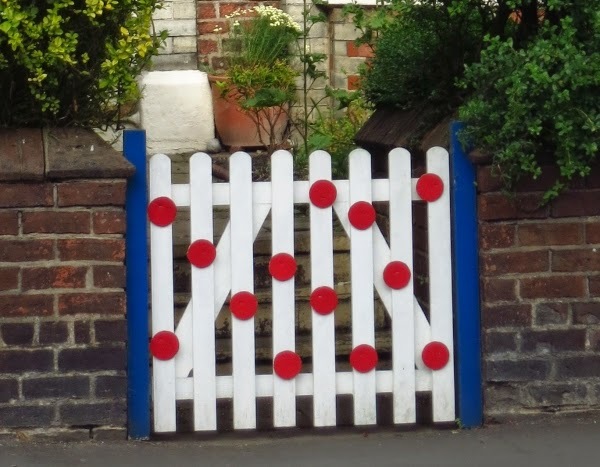 I was so impressed by the decorations along the route in the suburb of Bishopsthorpe, that I took some photos of them. I thought they were remarkably creative. Which one do you like best? I liked these ladies chatting on the doorstep and one of them had really gone to town. Look at the windows - little jerseys and bikes as well as everything else, and the front wall too. Can anyone anyone explain this one? My guess is that it refers to a cyclist from Mauritius, since the dodo is the symbol of that French speaking country. 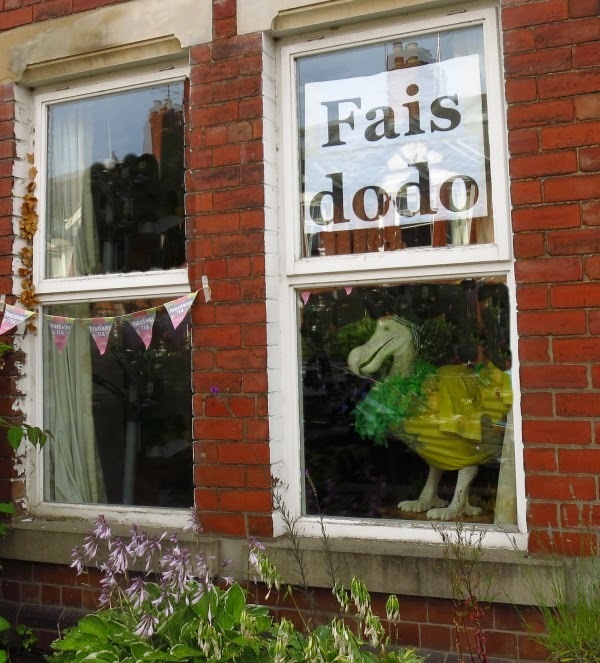 I love dodos and this was a very cleverly made one. The midwife who delivered my second child puffed and down the hills on her bike with a couple of oxygen cylinders on the back. But this one appears to have a baby in the basket. Not a real one, I am sure. 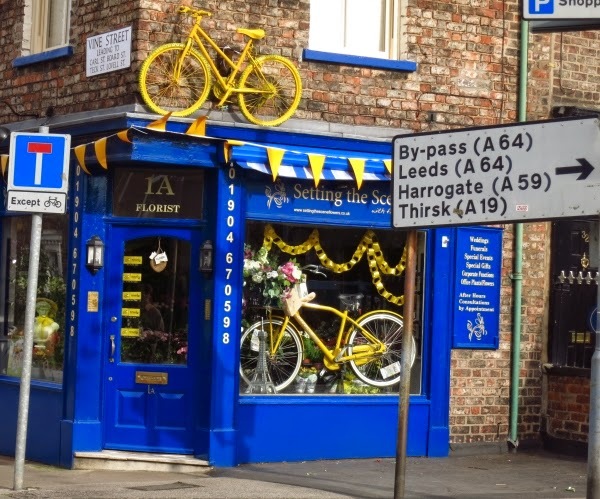 This florist shop went completely mad on its eye catching bike display, those look like the kind of hand made paper chains we used to make for Christmas, as kids - it was a lot of fun. on a new sign painted for the occasion. Now that IS impressive! I wonder if they will keep it. And even on a rather grey day the flags made a cheerful sight, fluttering as far as you could see. Oh, how fun! You got to enjoy the Tour de France without the crowds, you are so clever. Thanks for showing us the photos, wish I could have seen it this year. Meike from her blog had some wonderful photos from Yorkshire from her visit in June. And here's me passing through your colourful blog post Jenny. Tres bien. So cheery! I especially love the midwife's bicycle! What a lovely trip! Thanks for sharing. What a wonderful adventure that bike tour must have been.! I love to visit towns that are having celebrations. The spirit of community and just having fun is contagious. BTW, how was your seat feeling when your vacation was over? Must have been a surprise for the organisers of the Tour...France does nothing like it! These folks really take their decorating seriously. So much color and charm. I can see why you enjoyed it so much. Wonderful pics, Jenny...it sounds like you had a great time. Perhaps the Dodo bird was a subtle hint from the shop owner..."Do-do drop in!" How fun! My favorite is the dodo bird photo, and second would be the midwives one! But they all have their own charm! 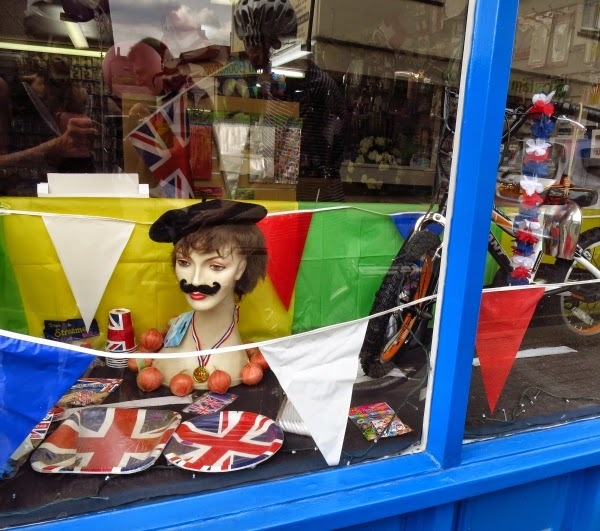 When I was in Yorkshire 3-4 weeks before "Le Grand Départ", I saw many similar decorations along streets, on house fronts, in shop windows and so on. Some farmers had spray-painted their sheep yellow, someone had made a white chalk bike on the hill (like the White Horse), and there were tiny knitted yellow jerseys strung along lamp posts and fences everywhere. People planted yellow flowers to "paint" the whole area as yellow as possible! It was a great event for Yorkshire, involving MUCH more than just the two days of the actual event, and while I am not sorry for having missed the madness of that weekend in July, I am pleased for them that they had it, and had such good weather, too. My sister-in-law was having a street party with all her neighbours, and my uncle and aunt stood at the road to High Bradfield for hours, loving every minute of it. I just love the way we can celebrate anything!! I wonder how many of those people gave a toss about the Tour de France, and just wanted an excuse for a party! (I've a daughter in Cambridge and I know she joined in, though she knows nothing about it!). These are great pictures, and show the British in all our wonderful eccentricities. Doing 'le tour' in reverse looks a lot of fun especially having the impressive decorations to watch out - they must have made the bike miles go much faster for you. What an energetic pair you are - well done. 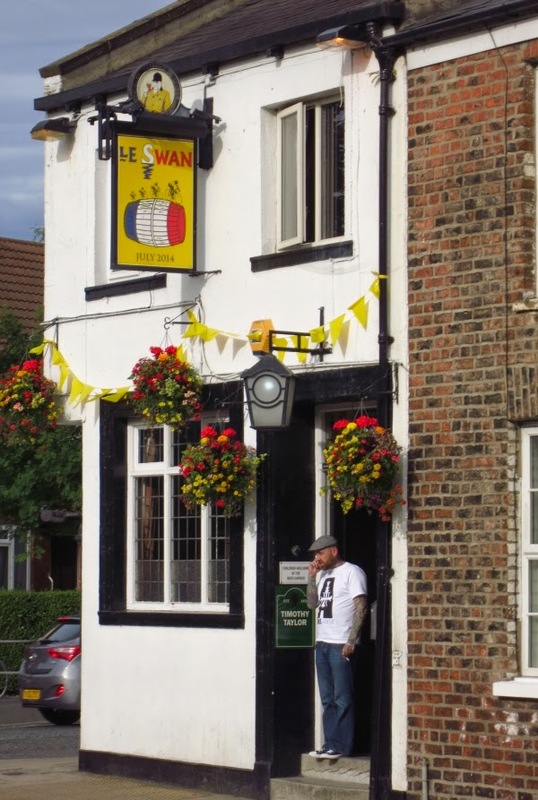 I really like the sign for Le Swan. What hits you between the eyes is the colour! Wonderful displays. As you say, this town seems to have really got its act together and that surely must indicate a very healthy dose of community spirit about the place. There do seem you have been absolutely yards of bunting. 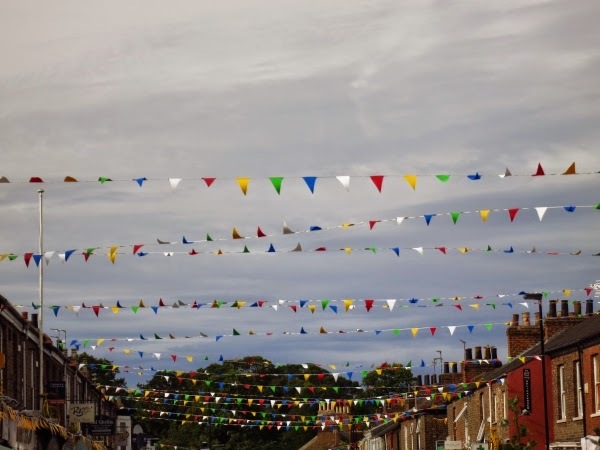 It fascinates us how on every special occasion, bunting by the mile seems to appear out of nowhere! And, there are clearly done very creative types with their own particular french theme. Amazing! How wonderful to take a journey via bicycle. I haven't cycled in more years than I care to remember. I never realized that there was so much hoopla over the Tour de France. The shop windows are all creative. 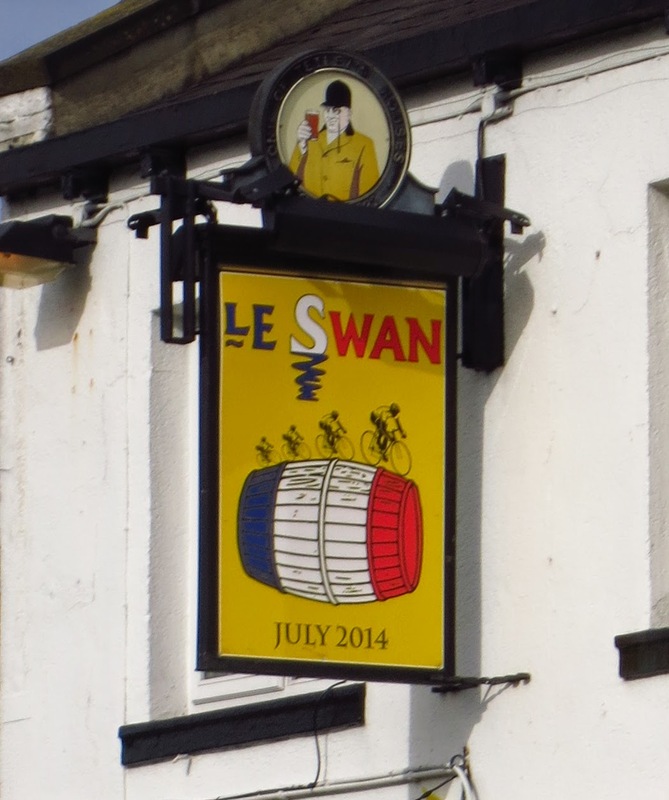 I like the "Le Swan" sign, the dodo bird, and the midwives bicycle. It is quite extraordinary how the Tour has captured the British imagination, and what a wonderful show the people of Yorkshire put on to welcome them! It must have made your own bike ride so much more interesting too. Some wonderful decorations there. The Tour de France clearly captured people's imaginations. 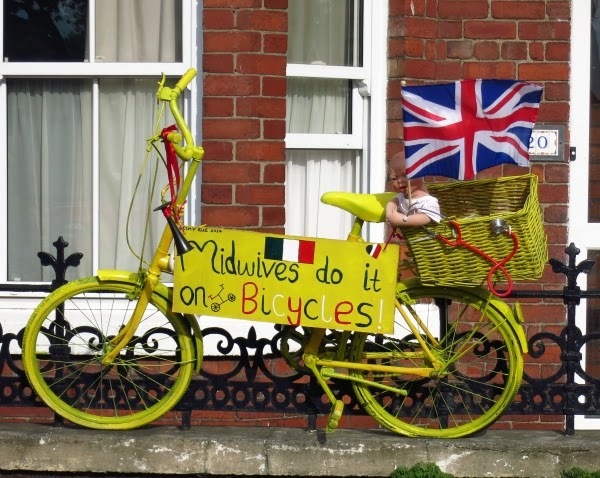 There were similar ingenious displays when the Giro d'Italia started in Northern Ireland earlier this year. Bikes and Italian themes everywhere you looked. That sounds like quite a cycle trip you took. You must be pretty fit! Jenny, I wish I wsa there to see this! They're all wonderful. 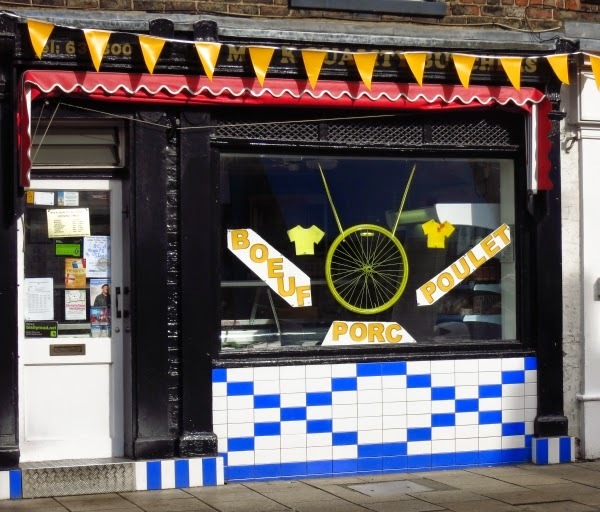 We watched the Tour through England (and everywhere) and they would sometimes show bits as they passed by in the towns. The crowds were huge, as big as France and we decided there should be the Tour de U.K. too! I can't tell from the photo but on the Bienvenue photo, that may have been an attempt to make the TDF logo... I loved that banner most, though! Another super Tour de Thirsk! Great read but cycling all that way! Great fun I must say even if it was all uphill. Great trip! My wife and I did get to see the start of the Tour de France in Strasbourg 8 or 9 years ago. It was exciting. 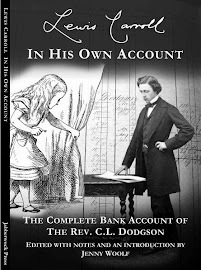 I have not been blogging for a while either, so this post was a great boost for me. Looks like a lovely, upbeat town. Loved all of the festive banners and signs. Thanks for visiting my blog and leaving such a nice comment. Wow, how cool! We've had an annual bike race here too, but the community doesn't get nearly as excited about it, which is sad. But then, the race is nowhere near as prestigious as the Tour de France. I volunteered there a few times and it was a lot of fun. What a neat idea to decorate the town in honor of the Tour de France! It all looks so cheerful. I wonder if the cyclists noticed it and it made them smile, or if they just raced through and didn't pay much attention. And hats off to your cycling accomplishment. I haven't been on a bike in forever...not sure I could still ride one! Neat. And I think Fais dodo is also Cajun. Means a party or something like that. What a fun way for the community to celebrate! While i don't know about other French speaking areas of the world, "fais do do" is Cajun for "go to sleep" and is what the Cajuns call a dance party. The term dates back to when one of the nanans (godmothers) would take all the children into one room while everyone else partied in the other part of the house. She would sing them a lullaby that started "fais do do", and that's what the dance parties came to be called! The midwife's display is probably my favorite. Midwives do it on bicycles?? I love that!! So funny! I Love all of these pictures! I didn't know that you were a cyclist, that's very cool, I have never really biked anywhere and now you have put an idea into my head! What fun to see Merrie Olde England so French and Festive, Jenny. It must have added extra enjoyment to what was a very long cycle trip. I admire your fitness! And I do love the yellow combined with red spots - so cheerful! I love the obvious enthusiasm, and the midwives who do it on bicycles... smiles. What a lovely, lovely post, Jenny! I so enjoyed this. 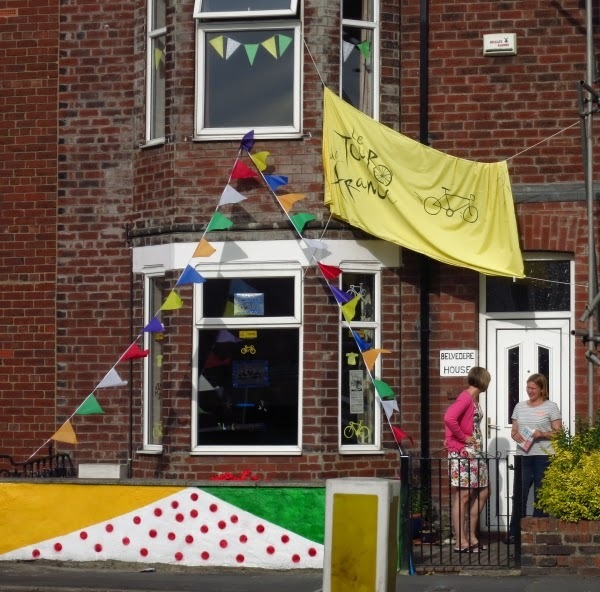 What lovely creative ways of celebrating the Tour de France. And…I'm so impressed by your journey! That's a fantastic trip to have done. Well done you!! I still can't wrap my head around the Tour de FRANCE visiting England. I suppose William the Conqueror would have approved, though. 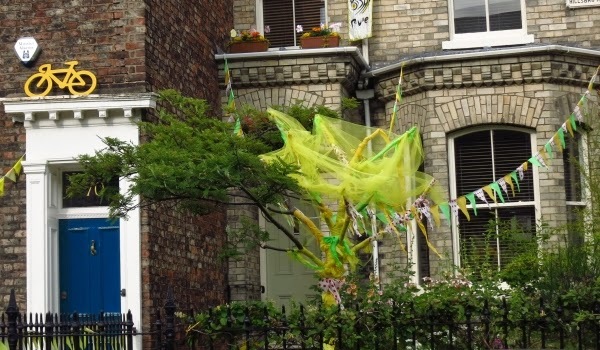 Over at Weavers of Grass blog she mentioned all the towns in Yorkshire were decorated. Even the towns that the riders did race through. In one window they had a bike the the knitting club decorated. The bike looked wonderful. They certainly went to town didn't they?! I was smiling while reading your post as I used to live near Saffron Walden in Essex and recently went to Bishopsthorpe in York (however that was to the Palace!!) so didn't get to see the town itself. I am impressed with your bike journey as it took us three hours by train to get from Lincolnshire to Co. Durham so I applaud you both!! I love the neighbourhood participation! I also like the thought process... What's French? Moustaches and onions! Yeah, that'll do it! :-) It's hard to pick a favourite of all these thoughtful decorations, but I do like the big yellow arrow. That-a-way! Your life is awesome! I need to be more adventurous. Probably not with a bike my bum might swallow the seat. What a lot of bike riding you did. Enjoyed seeing all the decorations people made for the event. I like the midwife bike a lot and that last photo of all the banners seems to show how much community spirit was going on. Great! I can't imagine traveling for a month on a bike especially with all the hills that I have in this area. I am amazed at this! Initially, I was terribly envious at your cycling trip--oh, wouldn't I love to do that? But your photos took me along ,and now I almost feel I deserve a pint! We even heard about this and saw some pics of the special decor over here! Or maybe I was watching BBC news over here which is why. In any case, I was intrigued that the Tour de France would be coming to England for part of their race! My husband refused to believe me when I told him, until he saw it for himself. I don't know how you managed that long trip on a bicycle! Good for you. The Tour goes so quickly through all the towns that it is hard to look at the decorations. I am pleased that you showed them – they are very creative and fun. Wow Jenny! What an impressive bike ride! I don't think I could manage more than 2 miles at a time although I can walk much further. I am sure your big trip will be so exciting! Please take care. You have to visit Japan in your best condition!! Yoko, Cosmos and I are very close friends. I hope you will not be surprised that my English is just for easy conversation. Please visit my post' Come and join our trip to Kyoto" posted in the end of August. I will be back your new post again later. Thank you for linking" Tomoko".